Posted on February 11, 2014, 11:41 pm, by Jack L. B. Gohn, under The Big Picture. Hudson County Superior Court in Jersey City sure was the perfect place to hear about the recent flap over the Coca-Cola Super Bowl commercial. I’m sure you’re familiar with the commercial by now; it depicted a multi-ethnic, multi-generational crew singing America the Beautiful multilingually. There were a lot of angry comments from the commentariat and on Internet postings, complaining that that song should only be sung in English, and/or not by people who looked Hispanic or Arab or worse, Muslim. You may not be as familiar with Jersey City, so let me tell you two things about that town, where I spent several days in a trial. One, it has a killer view of the Freedom Tower from across the Hudson. Two, as a judge there told me proudly – quoting, as I later learned, statistics compiled by Business Insider – it’s the second most ethnically diverse city in the nation. Now I don’t know how you quantify and rank diversity, but obviously Business Insider and the judge were onto something. Across the street is a McDonald’s I visited several times as the case dragged on. High-schoolers flock to this McDonald’s at breakfast and lunchtime, and they come in all varieties: young women with headscarves chatting on cellphones, a homeless black lesbian student working the phone to arrange the next friend’s house to crash at, a South Asian young man toting an algebra book, Hispanic kids networking like crazy. Not all that many white faces, and few faces my age. This surge of multicolored kids getting through the practical tasks of growing up and living day-to-day is exactly the customer base Coca-Cola was wooing with that spot. Well, actually not just the kids. There are blocks in Jersey City where it seems there are no two restaurants serving the same national cuisine. But they all serve cola. Looking around this McDonald’s, all you can see are Americans. Some are doubtless citizens or legal immigrants. Others may not be documented. Whatever their current legal status, however, and whatever languages they happen to use, they’re all truly Americans right now. Witness one Korean girl gossiping to another: “And I’m like ‘[insert Korean phrase].’ And she’s like ‘[insert another Korean phrase].’ And I’m like ‘[more Korean].’” I’m sorry, when you lapse into idiomatic American English to punctuate a story, it doesn’t make much difference what language you’re using to tell the rest of it or where you’re from originally or even what your papers do or don’t say; you’re already here. You’re already one of us. A couple of months earlier I had been in a federal courtroom in Raleigh, NC. There the cultural determinants had been a little different, and probably much more to the liking of the kind of people who take umbrage at the Coke commercial. My local counsel had spent four years writing speeches for Mitch McConnell, the judge was reportedly a protégé of Jesse Helms, and he spent some time observing on the record how there were no unions to speak of in his state. But the actual experience of arguing that case was not markedly better or worse than what I experienced in the Hudson County Superior Court. It s not even different when it came to the judges. (Not altogether a good thing, by the way. We litigators have the same wary attitude toward judges that valets bear toward their masters. And as the poet Goethe remarked, no man is a hero to his valet.) When the rules of courtroom decorum and of evidence, the jurisprudential principles and the constitutional doctrines are all the same throughout a system, judges can’t be too much better or worse either. Now, it is certainly true that a big reason for the sameness of the experience was the English spoken in all of these courtrooms. And I don’t expect our growing diversity to change that. But what if it did? Back in 2005, I was on my first visit to Miami, which I have heard called the capital of Latin America. The morning after I arrived, I stepped up to a coffee counter. A blonde Anglo customer in the next line, a woman my age, burst into a rapid gust of Spanish while placing her order. I was amazed by her fluency, and I think I chatted with her for a minute afterwards, to confirm that she was, like me a native English speaker. She allowed as how she was. She’d just picked up the Spanish – I guess the way the “I’m like” Korean girls I mentioned are picking up English. And I didn’t think I could ever do that. But these days Spanish is all around. Fragments of it come to you the same way new English words do. 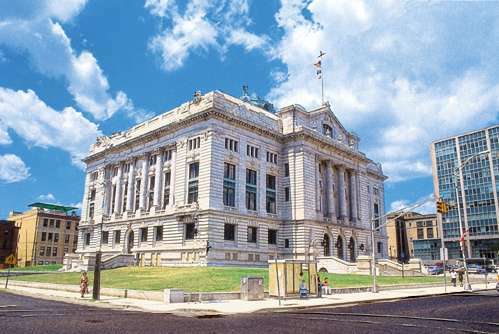 A month ago, a legal question I had to answer called for me to explore a couple of published opinions of the Commonwealth Courts of Puerto Rico. And guess what? Their rulings are in Spanish. And as I say, I don’t really speak Spanish. But somehow I was able to get what I needed out of those cases. We learn more than we know. As other languages become more prevalent, we figure it out. And new generations learn new languages on both sides of the divide. One of my own sons, a member of the bar with no more Hispanic heritage than I boast, speaks Spanish fluently. It’s all going to be fine. The problem is not really with the newcomers; it is with the people whose heads are exploding about the commercial. It is hard to doubt that what they fear is further erosion of the privilege that (check all that may apply – and they all do in my case) Anglophone straight white Christian males have enjoyed. As among citizens, the privilege question has been mostly answered by these little things we have called the First and Fourteenth Amendments. Our government should not be bestowing unique status upon any faith, race, heritage, or set of ideas. And to the extent America was built on that kind of privilege, we are headed away from it, and never going back. Rear guard skirmishes notwithstanding, that battle is clearly won. But there is still conceivably a viable line of defense for privilege when it comes to citizenship itself. The head-exploders about the commercial are the same folks whose heads explode at the “path to citizenship” proposed as part of immigration reform now. They can claim all they want that they are only trying to uphold the rule of law; I simply do not believe them. To me, the dynamic is clear: “illegals” constitute an underclass, a cultural Other, whom the head-exploders do not want to see rendered equal to citizens and immigrants. If we give “illegals” immigrant status, we make privilege that much harder to preserve. That’s the real reason for the uproar. There is no decision in this fight to date. But if Jersey City has taught me anything, it’s that those diners sitting in that McDonald’s, swigging (yes) Coke, are really our kids, our heirs and our successors. And our system won’t change much as they come into their inheritance. Nothing to fear.
. My own picture of the scene.
. I am not one to let a good anecdote stand in the way of the truth. But a 1200-word limit (which is what my Daily Record columns operate under) does nudge one in the wrong direction. So, to be clear: a) the young women in headscarves (walking with a friend not wearing one) were encountered on the pavement just outside the McDonald’s, not dining there; b) the Korean girls were encountered elsewhere within a week of the Super Bowl, though I did hear the snippet of conversation just as I recount it. But let it be noted that Hudson County, of which Jersey City is the seat, has a substantial Korean population.
. Elective Affinities (1809), here at page 335.
. Nor do I place much store by the “rule of law” arguments on their own merits, as discussed in an earlier column.